Ever been BASE jumping? Yeah, me neither. The closest I’ve come is with AaaaaAAaaaAAAaaAAAAaAAAAA!!! (Force = Mass x Acceleration) [$2.99] by Dejobaan Games and Owlchemy Labs (the folks behind Snuggle Truck [Free]). 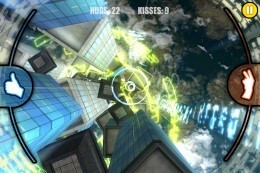 This is the latest in a series of extreme BASE-jumping titles from Dejobaan, but it’s the first to come to iOS. As we mentioned in our preview, it’s a somewhat shortened port of AaAaAA! for the Awesome, and it’s pretty fantastic. I’ve messed around with the PC AaAaAA! titles, but they’ve never really clicked for me. Now I know why: I wasn’t playing with tilt controls. There’s a world of difference between controlling a fall with a joystick or mouse and peering down over a massive drop, diving over and holding your fate in your hands. Not quite the difference between playing a game and actually jumping, but it’s still pretty great. Tilt controls are a turn-off for a lot of people, and I’m no exception. I like the idea of being comfortable playing a game while out in public, and that’s a lot less possible when you’re thrashing around like someone who’s never held a controller before. I set that prejudice aside for AaAaAA!, and I have no regrets. The tilt controls are precise, kinetic, and massively immersive. AaAaAA! is BASE jumping in a fantasy land. The acronym stands for buildings, antennas, spans and earth, and those are the things you’ll jump from here, but they’re structures designed by a madman in a world without physical constraints. Hundreds of towers floating and merging on top of one another, highways that spiral in and out and around each other in endless stacks, ventilation shafts with dozens of fanblades leading into great tunnels of rings – these are just some of the pathways and obstacles encountered during the game’s many journeys to the ground. This take on BASE jumping also ratchets up the difficulty from reality. The sport is incredibly dangerous, but much of that sense of danger would be lost in a straight digital translation. Most levels would be a quick fall with a brief landing. Instead of being ranked by distance traveled, here players are ranked by how much risk they can take on without breaking every bone in their virtual bodies. Scores are determined by kisses and hugs: a kiss is a structure near-missed, and hugs are earned by holding close to any single structure. This is, as one might imagine, extremely likely to end in maiming, and should never be tried at home. The result is a very tense game. I found myself gripping my phone tightly, jerking it out of the way of this oncoming girder or that platform I hadn’t noticed. A prayer under the breath seemed suitable after some tight escapes. It was more than enough to convince me I’m not cut out for BASE jumping, but I sure enjoy the facsimile. AaAaAA! comes equipped with a few dozen levels, and you can choose how you want to approach them. You begin with a small supply of teeth (and has there ever been a more disturbing currency name?). These aren’t a premium currency, you earn them in-game. You can unlock any level beside, above or below one you can already access, using a thousand teeth or so to open each of the first few. The costs increase from there. So do the rewards: you earn up to 1300 teeth per star, and each level awards up to five stars. 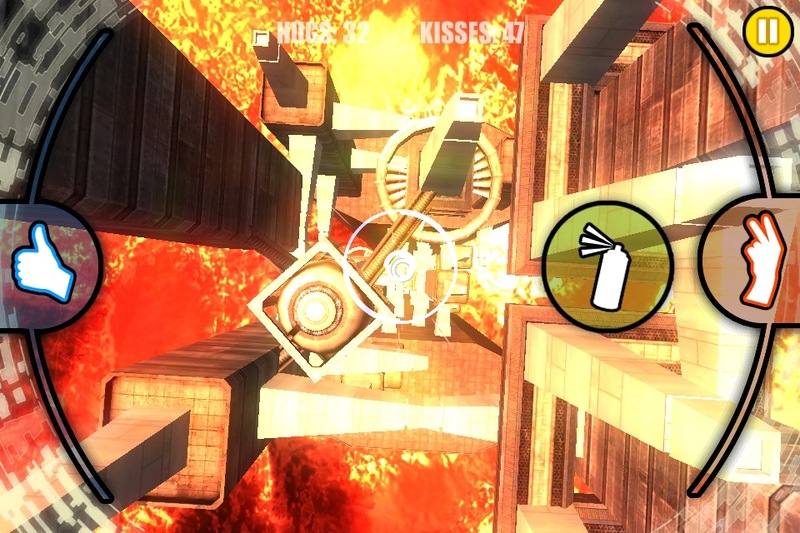 To get top marks, you’ll need to use the unlockable tools you can find scattered in the level map. One gives you the ability to interact with spectators. Fans stand on blue girders in some levels, and protesters stand on red ones. You can give your fans the thumbs-up for extra points, and you can flip off your foes. It’s a particularly satisfying way to earn bonus points. There are also bonuses to be earned for spraying graffiti on government buildings, if you want to be a little extra subversive. 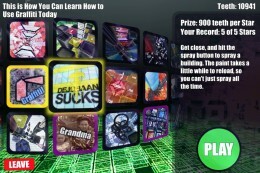 Otherwise earning the big scores just requires good performance and a bit of understanding of the level layout. 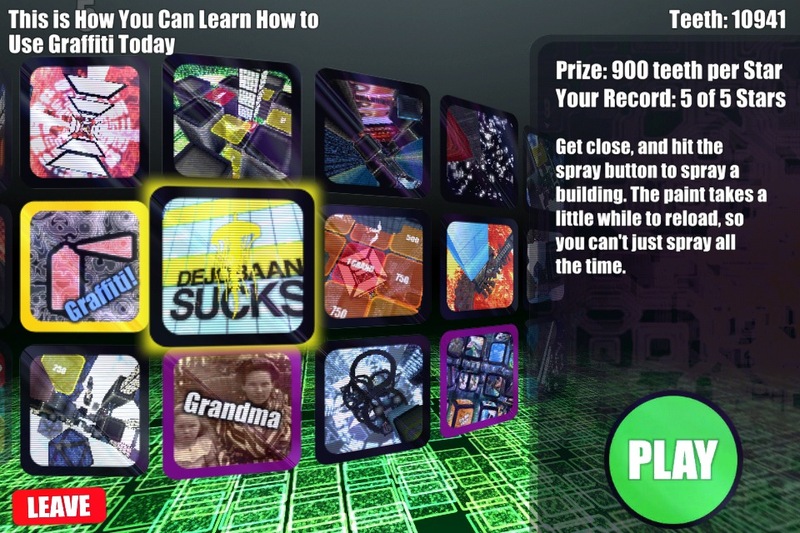 Each level comes with a training blurb to help you find the best approach. Sometimes that’s whipping around collecting kisses, other time it’s aiming for bonus score plates. Once in a while it’s hitting birds on the way down. The game can be a touch gruesome, but the looks are always sterile and unbloodied. You don’t need to do extremely well to unlock all the levels—an average of three stars or so should do. It’s just more fun to go for five. Also worth noting is that 21 of the levels are leaderboard levels. Game Center’s restrictions don’t allow for all the levels to come with leaderboards, but there’s a nice representative mix that you can compete on. There are a few extras to be found in the journey, but I won’t spoil them. Suffice it to say that Dejobaan has a quirky sense of humor, and there are oddities to be found around every corner. Some are obvious, like entertaining splash screens and odd vocal cues. Others can be unlocked, and ought to be experienced at least once. In fact, I’ll go ahead and say the whole game ought to be experienced at least once. I’ve had a ridiculously good time with it. AaAaAA! is an excellent game, and for me, at least, this is the definitive way to play it. The quirkiness goes overboard from time to time, but it’s easy to skip past to get to the good stuff: the white-knuckled dives straight down to near-certain death. It’s almost enough to make one want to BASE jump. Or maybe skydive—if AaAaAA! taught me anything, it’s that my extreme sport career would be short-lived. If you’re also into armchair sports you should pick this game up, then drop by our forum thread. We’d love to hear about all your close calls.